Benchtop analysis of ICs, PCBs, and electronic products in general require stimulus to view performance questions. Creating stimuli setups is often part of the development process. The need can also arise when product issues are discovered. To quickly achieve a setup might require lab equipment that is shared and currently not available. It might require writing unfamiliar code using tedious techniques. Validator 1 was born to provide a fresh approach to the problem of how to quickly generate a setup. 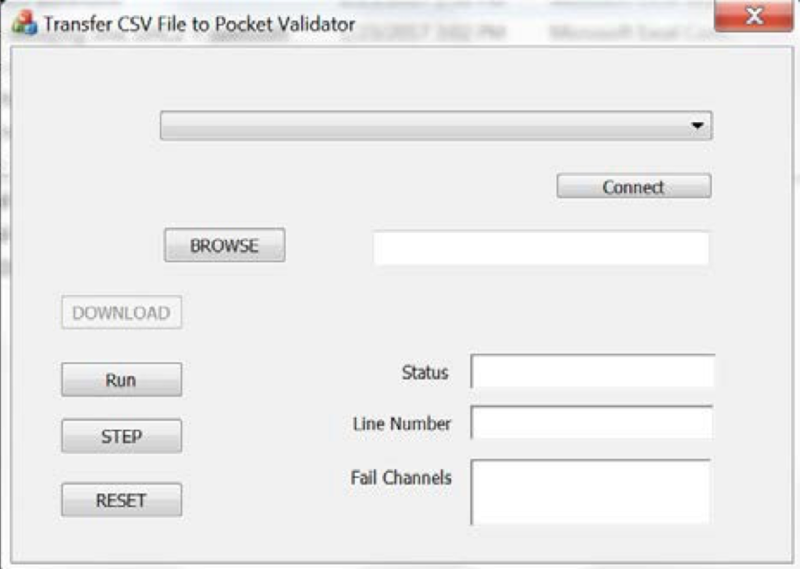 Validator 1 is priced to be a personal tool and is programmed in a format you probably use in other daily endeavors, the spreadsheet. Spreadsheet format is combined with traditional tester time step parameter definitions to provide powerful options for editing. In addition Validator can do digital test, create patterns with conditional jumps, start on edges, synchronously operate as parallel units, and more. 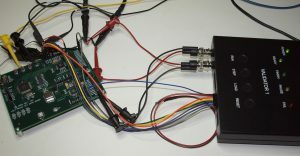 The example that follows is based on actual experience by the author evaluating an SPI ARINC 429 receiver IC product design, the HI-3598. 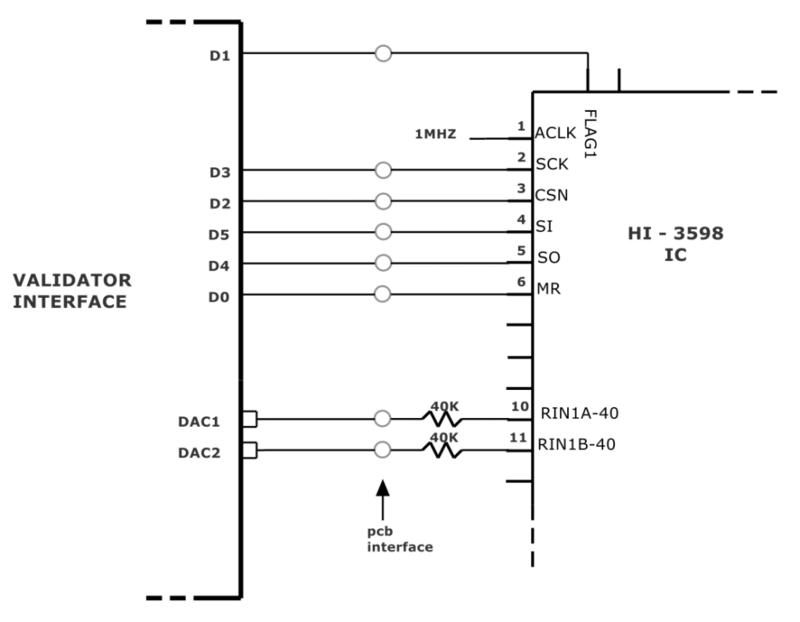 The data sheet for the HI-3598 IC is attached in Appendix A. The demonstration problem is to measure the threshold amplitude of an incoming ARINC 429 word to one of eight receivers. Since the HI-3598 will only show detection for a full 32 bit word presented in the proper protocol, the incoming differential signal amplitude will be incremented after each full word while monitoring the receiver flag to indicate threshold crossing. For new designs the evaluation setup might simply be an IC socket on a vector board or PCB. 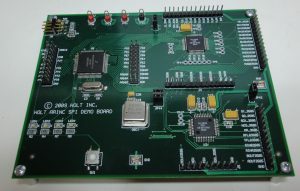 For this mature product, we will use an available demo board. To control the pins, the demo microcontroller pins are disconnected from the inputs to the HI-3598 IC. The Validator assignments were arbitrary. 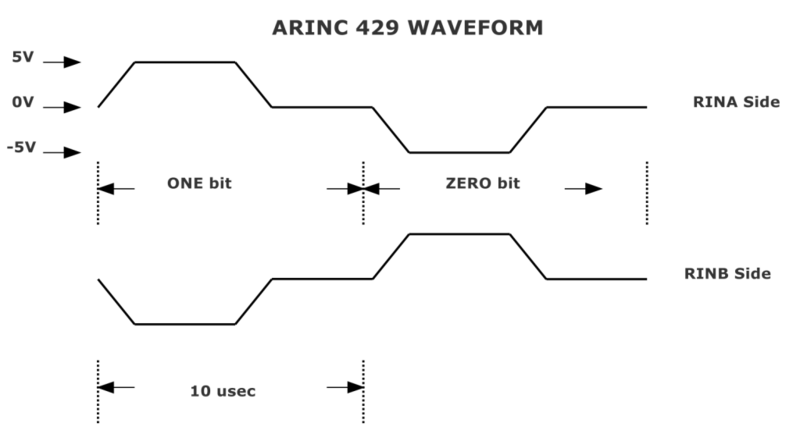 DAC1 and DAC2 will be programmed to deliver a variable amplitude differential signal meeting the ARINC 429 protocol for wave shape and frequency. The digital IO will handle the SPI communications. Arbitrary analysis setups tend to get messy. If I thought I would be coming back for more analyses in the future, I would make a custom HI-3598 IC evaluation board with connectors for the Validator or ——- I could just stay messy. NOTE: The HI-3598 works with 3.3V standard IO which is the same as Validator’s IO. If some other IO standard was needed, the Breakout Board, which is included with each Validator, has translators to accommodate digital IO operating anywhere from 1.5V to 5.5V. The pattern preparation in that case would start with the template spreadsheet “BREAKOUT VOLTAGE TRANSLATE”. We will start pattern preparation with a template spreadsheet, “DATA ENTRY BLANK SHEET” which is available on the memory stick shipped with every Validator and also at the website. This file can be opened with a variety of spreadsheet programs. Some can be downloaded for free. For this exercise I am using Excel. Clock Divide This decision gives us pause. The issue is controlling the rise and fall times out of the DACs to make the waveforms meet the ARINC 429 standard. The standard is maximum 2 microseconds and minimum 1 usec for high speed operation which we will check first. Ext Clock Out Even though we have no plans for using the 24 Mhz Clock, we will make it available as a reference. Note that this output shows only the clocking as the pattern runs. SYNCH START No reason to use this option. Both the option and edge selection will be left 0. Stop on Fail We could set this variable to a 1. Then we could observe the Line Number shown on the Control Panel when a receiver Flag test fails. The test would be looking for the Low to High transition of the Flag which occurs when the transmission is actually received. If we know the Line Number, we can look in the pattern for the amplitude of the last transmission which will be the threshold. We can also figure out the threshold just looking at the scope traces. We will try this variable both ways. For now leave it a 0. Master Clk Out We will leave this variable 0. This option is handy for connecting multiple Validator units in parallel. If it is a 1, the External Clock Input BNC turns into an Output of the internal 24 Mhz clock. Then parallel Validator units can be run synchronously using this signal as their External Clock Input. The next step is to add labels (annotation) in row 18 and set the initial values for all connected channels. Note: “Row number” will be defined as the spreadsheet row number to the far left, while “Line number” will be defined as the value in spreadsheet column A. SO and FLAG1 are outputs and therefore these pins will be Z, which is high impedance with a 40K pulldown. Write to Receiver 1 Control Register to set up the Flag, Hi Speed, and receive options. At the end of the pattern we will read the received data. 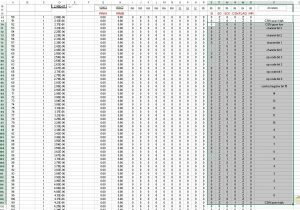 The main purpose of filling out the spreadsheet is to install the Line Number and Elapsed Time formulas. In this exercise it will not be necessary to change them any further and they provide a reference as we work down. Now go back to Line 2 and start entering the SPI pattern defined in the data sheet for a Control Register write. The Receiver selection is a 1 and the Op Code is 4. Annotation on the right keeps track of the bits and actions. The state of the SI input is clocked on the low to high transition of SCK. Color highlighting data like SI can help during the checking process. A formula could be used for the annotation of the Control Register Bit numbers. It is expedient to use copy and paste to complete the entire write sequence. Control Register bit 5 was programmed One to set normal operation. Leaving all other bits at Zero sets high speed receiver operation with the FLAG1 bit going High when the receiver recognizes an protocol Word. The next step is to perform a Control Register read. The SPI format is the same as Control Register write. The SI data needs to be manually adjusted for Op Code 5 and, to be tidy, remove the One at Control Register bit 5. The next task is to create a ramping amplitude ARINC protocol waveform and word with DAC1 and DAC2. First we will create a couple of variables, the starting amplitude and the increment. Both numbers apply to the differential amplitude. One method to create variables for formulas is to simply select arbitrary spreadsheet cells to hold the data Since these selections are truly part of the Setup Data for this analysis, we will place these variables in the annotation section of the Setup Data area. We have to unfreeze panes to get there. We will freeze again and remember that the start amplitude is in Y4 and the increment is in Y7. Arbitrarily I choose to send an initial transmission followed by 10 transmissions, each with an increment in amplitude. So with a starting value of 4V differential and 0.2V increment, we will step to 6V. I expect to see threshold in that range. If I want a more accurate number after seeing the first threshold, I can change the start and decrease the increment to zoom in. I also arbitrarily choose to use an alternating 0 and 1 pattern for the 32 bit Word. The Validator DACs are not interpolating. They will step to each line value unless constrained by ramp rate or settling time. Ramping between 0 and 5V in 1.5 microseconds is near the DAC limit of 10V per microsecond. The typical settling time is 2.5 microseconds which usually manifests itself as overshoots. ARINC 429 protocol words are 32 bits each followed by 4 null bits which adds up to 360 microseconds at high speed. Since we want to fit 11 words in the maximum available lines (4095), we will choose to specify the transition and bit time in 4 steps. If we suspected that rise and fall were a critical parameter affecting threshold, we would want more resolution and therefore more steps. In this particular case, I can tell you in advance that this parameter is not so critical. The above formulas will be manually entered to create the first bit waveform. Note below the formula shown for Cell G121. Recall that the waveform is differential and therefore each DAC voltage is half the differential. After the 32nd bit, the Word Gap must be added for 4 bit times. To keep Cell addresses Y4 and Y7 from changing while pasting, write the variable addresses as $Y$4 and $Y$7. With no offset, DAC2 is simply the negative of each DAC1 entry. For alternating bits, the Zero bit is the negative of the One bit. We can now complete all the remaining Word transmissions with nothing but copy and paste. After pasting the 11th word to transmit, the One and Zero amplitudes should be 6V differential. Finally, although it makes no difference for the objective, we will tidy up the end of the program. 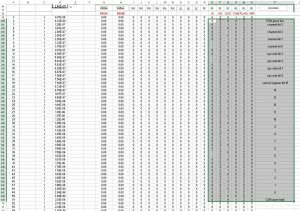 Select all the rows after the end of the SPI Read the FIFO sequence and delete th rows (not just delete the data). We are now ready to try out our pattern on the bench. The download file must be a CSV file. Save the file as a spreadsheet with a new title, “429 THRESHOLD HI SPEED” and then Save As in CSV (comma delimited) format. Click the Download button and we are ready to go! Below shows the SPI write and read of the Control Register as well as the first transmitted ARINC 429 bit. The SCK clock traces look uneven because of the scale factor. The DAC waveforms evidence a bit of overshoot. The rise and fall times are close to the 1.5 microsecond target. Observe below that the threshold was achieved after the 5th repetition (4th increment). Starting at 4V and incrementing 0.2V each time, the result is that a 4.6V amplitude is not received but 4.8V is. Looking at the differential signal below just before Flag1 goes High, the pulse amplitudes are roughly 4.8V. 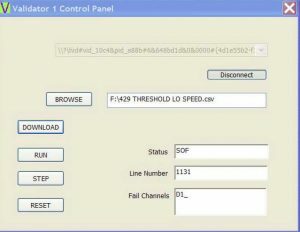 The last SPI communication, a read of Receiver 1 FIFO, is shown below. Note that the label bit order is reversed causing a 11 instead of alternating bits. The label bit order is a Control Register option. Set the Control Register bit 0 to a 1. This chooses low speed operation. Change the Start and Increment variables to 4.5V and 0.1V to get a tighter resolution. Save this file as “429 THRESHOLD LO SPEED” and save again as a .CSV file and download to Validator. Now when FLAG1 changes to a One, the pattern stops execution and displays the Line Number where the first Fail occurred on channel D1. Referring to the pattern, the amplitude at Line 1126 was programmed to be 4.8V differential for the previous transmission. The undetected amplitude before was 4.7V. That places threshold between 4.7V and 4.8V. We could keep iterating the Start and Increment variables to narrow down the precise threshold but for now, good enough. Below is the scope trace at the moment the pattern stopped on fail. At this 8X slower speed the rise and fall steps are much more evident. Resolving the differential amplitude looking at the 1V per division scope traces, we do see approximately 4.8V. As an exercise to show a use of the Pause instruction, we will measure the DAC peak voltages DC by pausing at the last two bits. The “P” commands shown in column E will cause pattern execution to stop. We will measure the voltages. Press Run again and the pattern will continue to the next Pause. This example has demonstrated a few of the options Validator 1 offers to drive an analytic setup. Pattern preparation for a mixed analog and digital requirement was demonstrated. It is always a good idea to consider future needs for similar issues. With a small investment in expense and time, Validator 1 could become a valuable addition to your personal toolbox. Click here to view Appendix.